This year for my birthday I wanted to do something different. I decided that this was the year that I would successfully raise money for a charity. Here is what I consider to be the keys to my success. This wasn’t my first go-around to raise money for a charity. The last time I tried to do this, I felt like I failed. I asked a few people and they did not respond. Why didn’t everyone stop what they were doing that very moment and make a donation to my page? As it turns out, there are a few tricks that can really help. 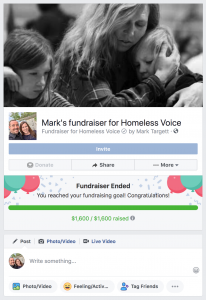 Make It Easy — By using Facebook Fundraisers, I was able to instantly invite my friends and family and give them a way to donate to my fundraiser for The Homeless Voice without ever having to leave Facebook. If you’re not on Facebook, Classy.org is another great option for setting up a birthday fundraiser for a worthy cause. Start Early – Don’t wait until the day of your birthday to ask for donations. I decided to start my fundraiser three weeks before my actual birthdate. Build Credibility – When introducing the organization you are fundraising for, make a clear case for the impact they create and the value of your dollar. Personal stories can make a huge difference. Post Frequently – I made a weekly update within my Facebook Fundraiser to keep my friends and family updated. As my birthday approached, I started posting even more to remind my friends. Respond Often – When someone donates, tag them in a public “thank you” post. This shows them how grateful you are, and also motivates others who have not yet donated to make a contribution. Make it Personal – When inviting friends and family, consider tagging them individually and adding a personalized message. Individuals are more likely to give if you take the time to ask them personally. This shows that you’re going the extra mile and really care about the cause you’re fundraising for. You can do this using messenger or tagging a friend in a post. Success is getting up one more time and trying again.